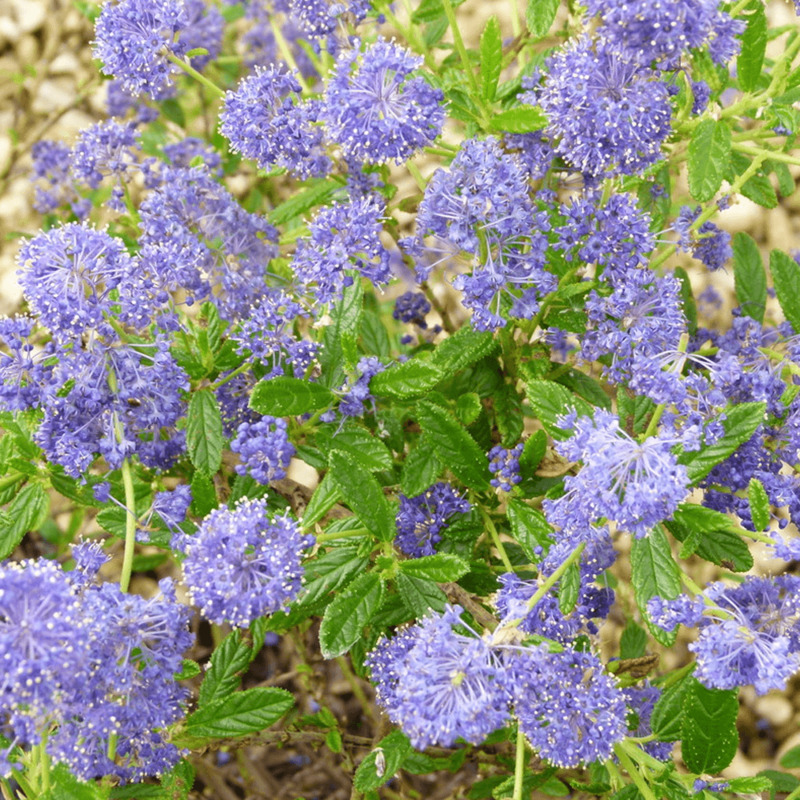 El Dorado is an unusual variety of Ceanothus noted for its striking colourful foliage and flowers. This Variegated Californian Lilac an evergreen upright summer plant that blooms blue flowers in clusters and lime-green leaves that set a beautiful contrast. Its flowers are fragrant that attract bees and butterflies. It’s a fascinating bushy shrub that is sure to brighten up shady areas in your garden. Use it along wall-side borders to add year-round interest to the garden. The broad leaves of El Dorado appear very prominent on sunny days. The oval leaves are marked with irregular yellow margins and green in the centre. The arching branches of this shrub are covered with leaves from top to the bottom that makes it a beautiful single specimen. In late spring or early summer, cylindrical clusters of small-medium blue flowers appear that are scented. This combination of golden foliage and blue flowers create an unusual but eye-catching display. El Dorado will thrive in full sun to partial shade but avoid strong afternoon sun to prevent scorching of the leaves. Plant it in a sheltered spot in average to medium moisture soil that is regularly drained. It is an easy to grow shrub but it is difficult to transplant once established, so choose the location wisely. Prune El Dorado lightly in May-June after flowering. The plant turns drought tolerant once it is established and reaches a height of 1.5 metres. Ceanothus El Dorado makes a charming and attractive hedge with evergreen foliage. It is an ideal specimen plant for sunny spots or used as in shrub borders and wall-side borders.